Background: Macrophages and mesenchymal stem cells (MSCs) are important cells in wound healing. We hypothesized that the cross-talk between macrophages and adipose tissue-derived MSCs (ASCs) is biomaterial dependent, thereby influencing processes involved in wound healing. Materials and Methods: The effect of macrophages cultured on polypropylene (PP) or polyethylene terephthalate coated with a collagen film (PET/Col) on ASCs in monolayer or on the same material was examined either through conditioned medium (CM) or in a direct coculture. ASC proliferation, collagen production, and gene expression were examined. 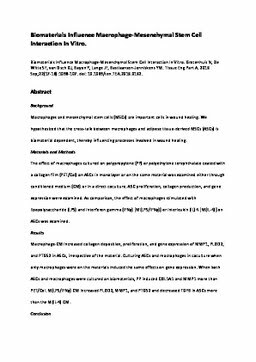 As comparison, the effect of macrophages stimulated with lipopolysaccharide (LPS) and interferon gamma (IFNγ) [M(LPS/IFNγ)] or interleukin (IL) 4 [M(IL-4)] on ASCs was examined. Results: Macrophage-CM increased collagen deposition, proliferation, and gene expression of MMP1, PLOD2, and PTGS2 in ASCs, irrespective of the material. Culturing ASCs and macrophages in coculture when only macrophages were on the materials induced the same effects on gene expression. When both ASCs and macrophages were cultured on biomaterials, PP induced COL1A1 and MMP1 more than PET/Col. M(LPS/IFNγ) CM increased PLOD2, MMP1, and PTGS2 and decreased TGFB in ASCs more than the M(IL-4) CM. Conclusion: Biomaterials influence wound healing by influencing the interaction between macrophages and ASCs. We provided more insight into the behavior of different cell types during wound healing. This behavior appears to be biomaterial specific depending on which cell type interacts with the biomaterial. As such, the biomaterial will influence tissue regeneration.